As we gather around the table on Thanksgiving Day and in the weeks ahead at a multitude of Christmas and Advent celebrations, let us pray that we gather with the sense of “conviviality” — sharing of life — that Pope Francis spoke about in mid-November. Conviviality is a big word for those moments at the table when all seems well — when we’re laughing, taking comfort in the company of those we love and passing the gravy. Unfortunately, that’s only part of the story. As Pope Francis points out, sometimes there is trouble at the table. Families are composed of people, and people are imperfect creatures. 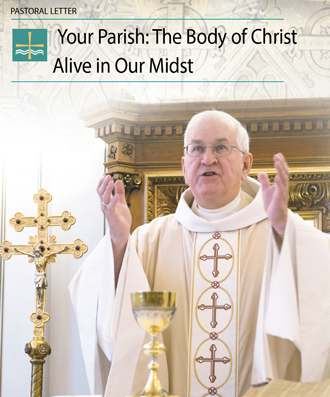 Archbishop Joseph E. Kurtz recognizes this and has urged the church to embrace both the “wounds” and the joys found in today’s families. During the Synod of Bishops on the family, held in October at the Vatican, Archbishop Kurtz suggested something wonderful. He recommended that families become “active agents” in the church’s mission to evangelize, despite of and because of their struggles. “Families face challenges and are wounded, yes, but they also possess incredible vitality and strength,” he said during his brief address. “As the synod seeks to offer concrete solutions to the many difficulties families face, we must enlist the help of the family itself in a very deliberate way and provide families with the formation they need to be active agents of evangelization. “We need families who can witness — even through their own wounds and difficulties — to the beauty of marriage and family life,” he said. This notion, that we can minister in our brokenness, because of our brokenness, should be inspiring to all of us. It’s a relief, really. Marnie McAllister is editor of The Record, the weekly newspaper of the Archdiocese of Louisville.